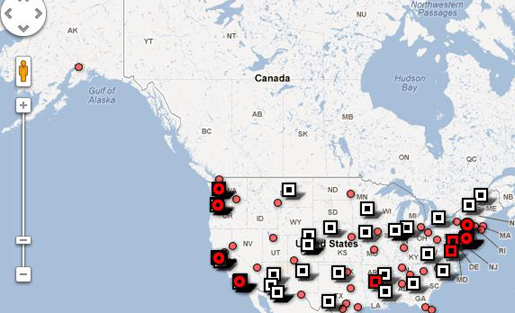 An infographic map on the Media Consortium's "Media for the 99 percent":http://www.mediaforthe99percent.com/ site showed where May Day protests were happening and linked to articles by participating outlets that contextualized the protests. On May 1, more than 30 independent media outlets collaborated to produce live national coverage of May Day protests. Why did these news organizations choose to collaborate — and why on May Day? The answer has everything to do with the insufficiency of our current mass media to cover this kind of event. May Day is International Worker’s Day and, since 2006, Immigrant Worker’s Rights Day. This year, the Occupy movement declared May Day “a holiday for the 99% … a day for people to come together, across all those lines which too often divide us — race, class, gender, religion — and challenge the systems that create these divisions.” Over 100 occupations pledged to observe May Day, and at least 50 held protests, marches and rallies, often partnering with unions and immigrant rights groups. Independent media doesn't answer to shareholders, but to stakeholders. Independent media is the 'media for the 99 percent.'" The May Day 2012 march of Occupy Wall Street. This nationwide action suggested some key questions: How deep is support for the Occupy movement? Can the movement work with labor? Can it overcome the barriers of race and gender that stalled earlier progressive movements? And, most of all, will the movement’s critique of class inequality change social attitudes and government policies? As a society, we rely on the media to pose such questions. The role of the press in a democracy is not just to tell us who, what, when and where, but how, and if possible, why. Providing that kind of context for a story — whether through an in-depth feature, sophisticated analysis, or investigative project — takes time, effort and resources. And let’s be honest, these stories are often challenging to read or watch, requiring people to stop multitasking and concentrate. All of which is another way of saying that they are expensive and often don’t draw mass audiences. That’s why some corporate media organizations decide that these stories just aren’t cost-effective. Instead, they at times offer, in place of news, what Sarah Palin quite rightly termed “infotainment.” Uncontextualized videos of police or protester violence, a close-up look at one disgruntled, colorfully dressed activist, or wide-panning shots of marches may make good TV, but don’t tell us anything about the “why” of what we see. New media tools, however, have opened up new opportunities. At the Media Consortium, a national network of independent media outlets, we realized that we could aggregate independent media content into media tools that could be embedded on individual member sites. Each outlet could contribute its own reporting to a TV show, an infographic, or a live blog; in turn, the livestream of the TV show, the infographic, and the blog could be embedded back on the individual outlet’s site. Instead of being pushed toward one central site à la Huffington Post, this model allows audiences to go to their favorite independent media outlet, where they can find national content created by the independent media sector (including their favorite reporters) as well as the outlet’s very own reporting. This kind of collaborative coverage capitalizes on the full breadth of the independent media sector — including the ethnic and geographic diversity so important to the sector — along with the sector’s emphasis on contextual reporting. All of the outlets working together make something greater than the sum of their parts. May Day offered the perfect opportunity to test this model. The day’s events required accurate, full reporting on the relationship between class, ethnicity, and immigration status. And the geographic range of events required a reach that encompassed New York, Los Angeles, St. Paul, Minn., and Chattanooga, Tenn. In short, the movement for the 99 percent required a media for the 99 percent. To answer this need, the Media Consortium created a website called Media for the 99 percent. On the website, we offered an embeddable livestream broadcast of Free Speech TV’s Occupy the Media show, featuring Skyped-in reports from independent media reporters plus an in-studio panel of experts, also drawn from independent media outlets. Second, we offered the embed codes for an infographic map showing where protests were happening and linking to articles by participating outlets that contextualized the protests. Finally, we provided a Storify, an easily embeddable blog through which we used tweets, video and pictures to narrate the breaking story of May 1 throughout the day. More than 65 outlets embedded one or more of these codes on their websites. Over 25,000 unique viewers checked out the Storify, with more watching the video. Did the impact of our reporting cause Reuters to change its original head, “May Day a dud”? Did the impact of our reporting counter a meme pushed early in the morning by right-wing bloggers that the Occupiers were terrorists (based on the Cleveland plot revealed that day)? We don’t yet have a tracking mechanism strong enough to know. We do know that our reporting accurately recorded lower-than-expected turnout in New York; strained relationships between immigrant rights groups and Occupiers in Los Angeles and Oakland; but also unexpectedly smooth coordination between unions and Occupiers in New York, Baltimore, Detroit and Denver. Going beyond the coasts, we were able to present reports from Honolulu, Daytona Beach, Fla., Anchorage, Alaska, and St. Paul. The need for the kind of collaborative, distributive independent media system the Media Consortium pioneered on May Day will only continue to grow. Corporate media may have a wide reach, but consolidation and budget tightening have reduced the number of branch offices and reporters even the largest operations can field. All too often our largest news shows feature pundits asking each other questions they can’t answer, rather than providing reporting or analysis from the field. Meanwhile, even though most independent media outlets can’t provide the reach of the big newsrooms, they can provide the depth and diversity of coverage that the bigger players often lack. That has certainly been true in the case of Occupy. While pundits have asked each other, “What is Occupy’s message?” independent media reporters have been working to understand the context of the protests — why thousands of people camped outside for weeks, spent hours at a stretch in General Assemblies, and marched yet again on May 1. A recent article by Mother Jones’ Josh Harkinson, for example, compared the May 1 protests to the immigrant workers’ protests of May Day 2006 and the anti-monopoly movement of the 19th century. Another, by Arun Gupta for Truthout, analyzed the power of Occupy to continue as a mass movement. What many independent media outlets have been lacking until now was the opportunity to apply this deeply contextual approach to live, multiplatform coverage of a major national story and the opportunity to reach a broader audience. By collaborating with each other through a distributive, social-media based framework, outlets that focus on particular communities of interest (like LA Progressive, Feministing, or Earth Island Journal ) can cross-promote each other’s work without diminishing their own brand or losing their native audience. It’s a model that provides greater reach to outlets and greater diversity and depth of coverage to audiences, a perfect win-win. 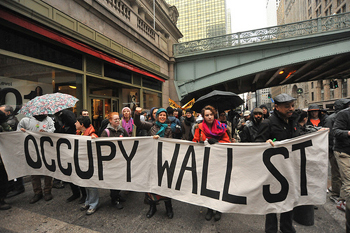 Image of May Day Occupy Wall Street march courtesy of Flickr user asterix611 and used here under Creative Commons license.